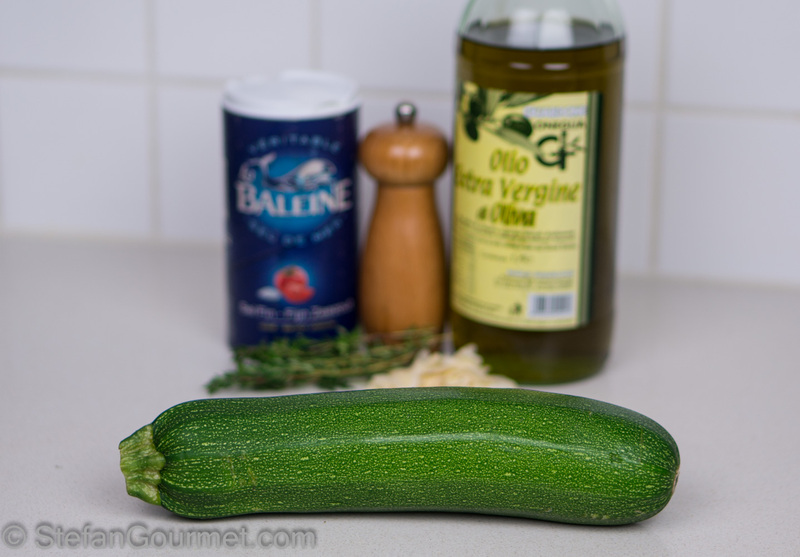 When I saw this original way to prepare zucchini as a side dish on the blog of my Italian blogging friend Bea, I knew I had to try it. I’m glad that I did, because it is absolutely wonderful. 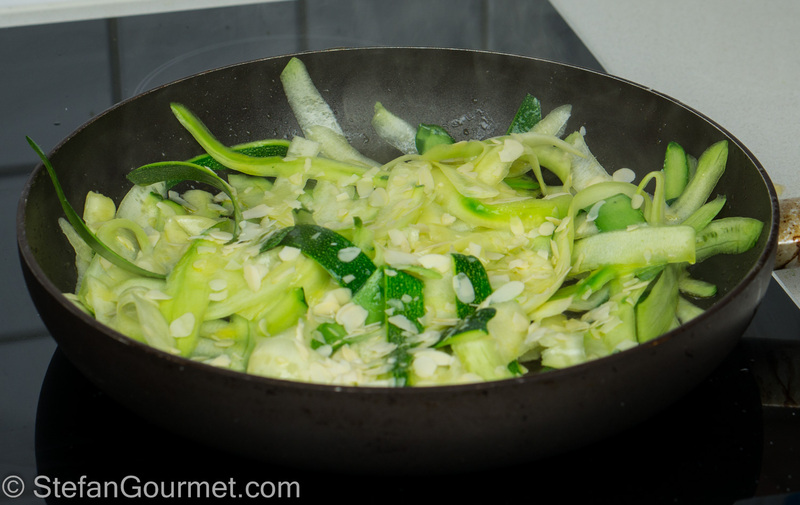 Zucchini is thinly sliced with a vegetable peeler, and then stir-fried with slivered almonds. 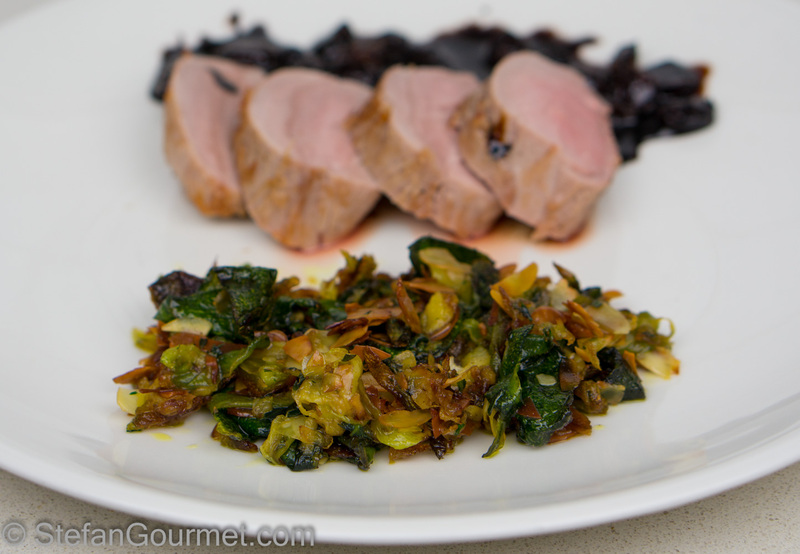 It was a wonderful contorno to pork tenderloin with a balsamic reduction. 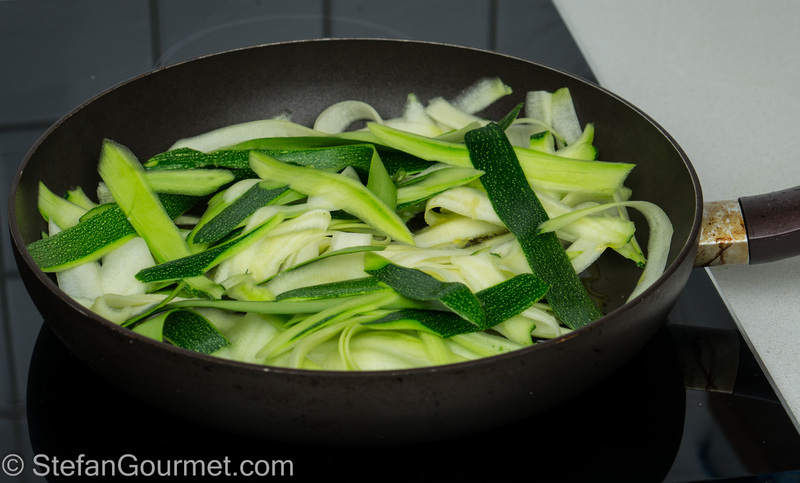 The texture is very different from other ways of preparing zucchini. I will definitely make this again, and since it is so original it is also nice for dinner parties! Grazie, Bea. 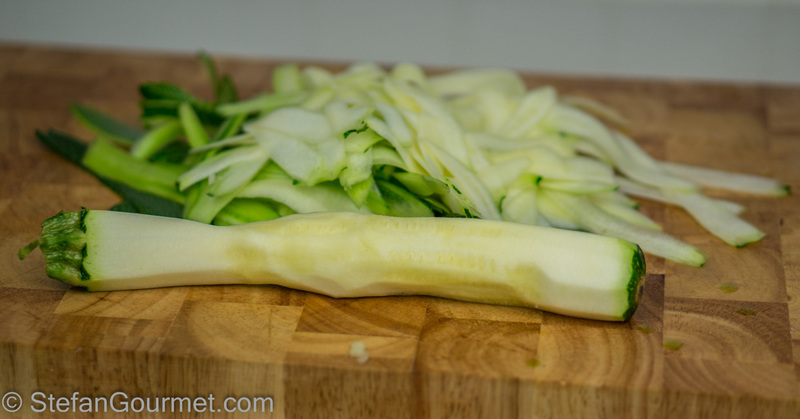 The only drawback is that it takes a couple of minutes to ‘peel’ the zucchini. Bea used parsley, but since I was out I used thyme instead. …and keep peeling until you reach the soft part with the seeds. Discard this, or reserve it for another use. 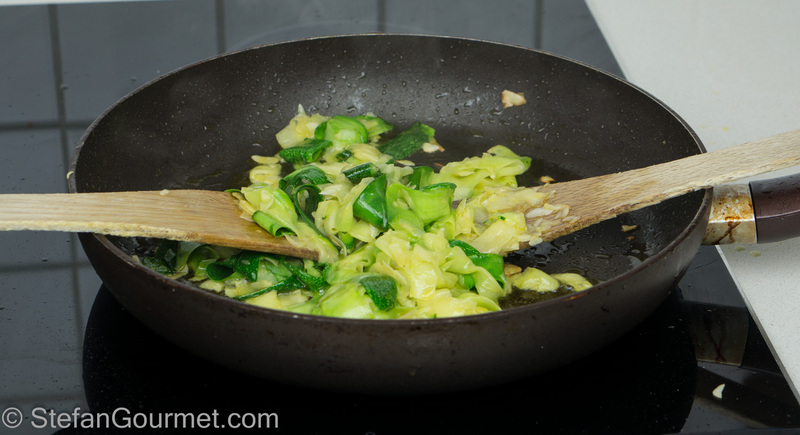 Put the slivered zucchini in a non-stick frying pan with the olive oil over high heat. 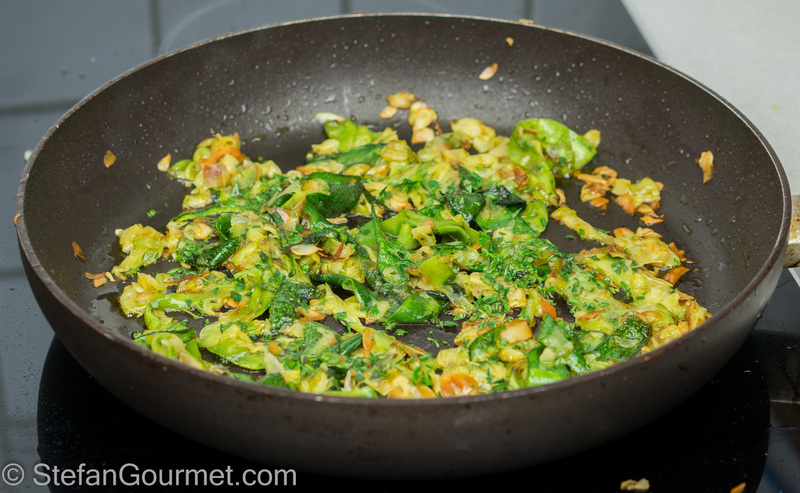 …until the almonds are golden and the zucchini is tender but still firm to the bite, about 8-10 minutes. Add the thyme during the last minute. Serve at once as a side dish. 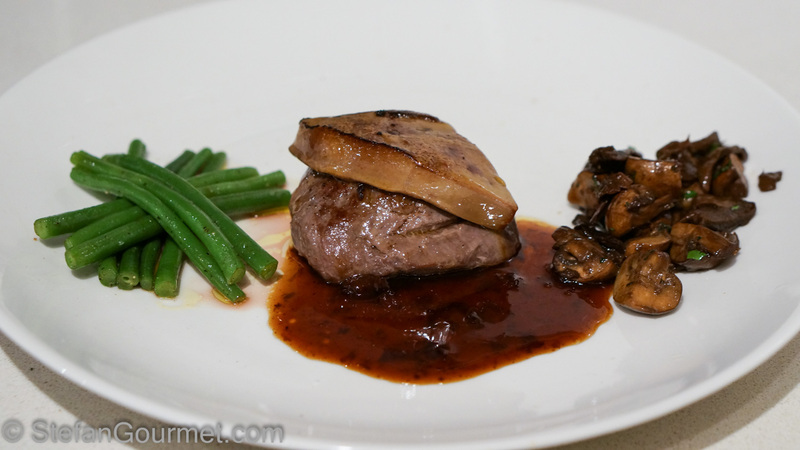 Tournedos Rossini is a steak of beef tenderloin (also known as filet mignon) with foie gras and a madeira demi-glace sauce. It is even better with some freshly shaved truffle on top. It’s become a tradition to prepare it every year around Christmas time.It is one of my favorite dishes and I still remember tasting it for the first time on June 17, 2003 at Auberge du Falkenstein in Philippsbourg (north-east of France). It was good there were hardly any other guests around, because the noises I was making while eating this might have caused other people to think we were doing something else rather than eating. It was THAT good. Simple and elegant Stefan. Why can I never get to post like this? You are too kind, Conor. What I personally liked about this post is that we had this tonight and that it took me only about half an hour to process the photos and write the post. I’m still learning how to use my new lights though. Especially how to cook with them in my kitchen. With just me my kitchen is fine, but with those lights it is a bit cramped! Tell me about it! The results are much improved. Things get a bit difficult for me when I have the lights and camera set up and mother, wife and daughters all want to come in and see what’s cooking. Now, that’s cramped. Thanks, I’m sure you’ll like this. fascinating! My husband won’t eat vinegar, sadly, but maybe I’ll make it for myself! There is no vinegar in the zucchini, so you can make it as a side dish to something other than pork with a balsamic reduction. Squisite! Le zucchine sono un ortaggio molto versatile: un vero aiuto in cucina. Sono felice che Bea te le abbia fatte scoprire come contorno! 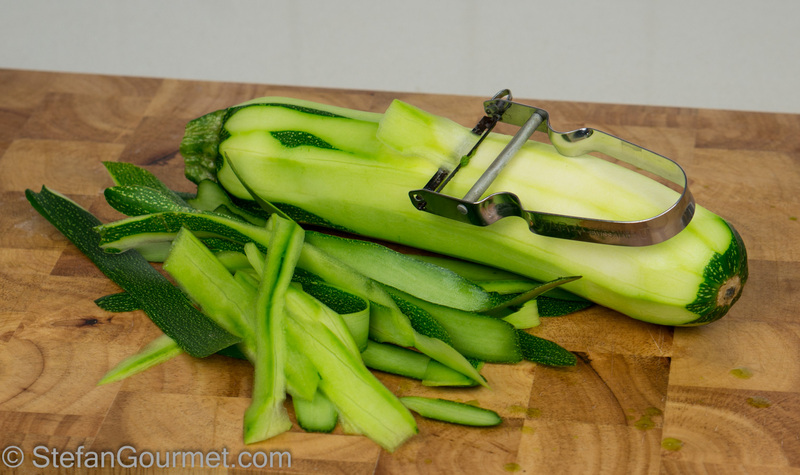 Thank you for sharing a new way to cook zucchini, I too am always looking for a a different way to use it. I tried the zuccini now twice and it is really good. Amazing how different a vegetable can taste depending on how you cut it. By the way, I fried it much shorter and it looked even better than on your photo (more golden). I certainly understand what you mean and it is true. One of the great things of food blogging! Thank you again for sharing the recipe.